Fished a half-day guided trip with a client in the morning, and then remained on the water for the remainder of the day to fish some areas I haven’t frequented lately to see if fish have begun using these area. This is the last day of 3 day warming trend prior to a cold front’s arrival due in tomorrow. FIRST FISH OF THE YEAR TAKEN ON THE FLY AT BELTON TODAY – 10 WHITES UP TO 13.25″ and 1.25 LBS. Air Temp: 68F at trip’s start. Temps peaked at 83F around 3:00 in the afternoon. Wind: Winds were from the S at 12 at first light, building to around 20mph with higher gusts by noon, and then gradually tapering off in the afternoon to around 12 by trip’s end. Skies: Skies were grey and overcast until around 11:15p, then cleared to fair skies for the remainder of the day. We began the day at 6:15a to allow a little time for my client to get accustomed to the fly gear we were going to attempt to use if the conditions allowed. This time of year I use a shooting head and running line to target suspended fish and bottom huggers down to about 18′ deep or so. The gentleman I had aboard was quite experienced with fly tackle and had done a majority of his fishing in saltwater, and so he caught on quite quickly, so, then it was off to find the fish by around 6:40. We first encountered fish under birds (gulls and terns) at Area 138. Despite the fair amount of bird activity, the birds were doing more looking than feeding, nonetheless, they lead the way to some solid morning action. Most of the fish we caught were on or just off the bottom in 15-22 feet. We smoked large blade baits vertically to entice the fish to chase. We boated 4 keeper hybrids in the first hour, along with 2 black bass, and 12 white bass. The bird activity ebbed and flowed, and finally ended around 9:30am. As it ebbed and flowed we short-hopped a few yards one way or another to stay under the most active birds and wound up with a total of 34 fish by the time the birds rested, all taken on slabs (3/8 and 3/4 TNT 180’s). The last dozen fish came out away from the Area 138 feature and to the north of it in ~31 feet of water. My client had to be off the water by around 11a, so, we decided to target some deepwater fish with downriggers in order to expose him to that method before he left. We focused on Areas 211 and 376 and picked up 4 small white bass at the first area and 4 larger whites at the second. The quantity of fish showing on sonar on or near bottom at Area 211 looked sufficient to slab for, so we dropped slabs down and finished up the morning trip with 6 fish off the slab including 5 average whites and a juvenile hybrid. These fish were very particular about the retrieve they responded to. Basically a slow easing technique is all that we could get them to respond to. We had to leave those fish biting in order to get back to the dock on time. We never did encounter conditions appropriate for fly gear, but, my client caught his first white bass, his first hybrid, and enjoyed his first outing on Belton Lake very much. After dropping my client off, I returned to fish, and found active fish under some light bird activity at Area 369 (catching 3 suspended short hybrid via a slow smoking retrieve) and at Area 377. At Area 377, there was a very large aggregation of fish from 12 feet deep down to bottom in 25-28 feet, these fish were in a neutral mode and thus were not moving much and were easy to stay on top of, but difficult to get to bite. I used a slow smoking technique to put 3 whites in the boat, then, due to a brief lull in the wind, decided to give the flyrod a try. I boated 10 whites in about 45 casts, all with the shooting head and running line. The fish I picked up were those nearly motionless suspenders at 15-18 feet. Once the wind picked back up, I changed over to a 1/2 oz. blade bait and worked for bottom huggers, taking the tally from 61 fish up to exactly 100 fish before I broke for lunch at around 2:00p. Of these fish, one was a keeper hybrid, and the majority of the rest were keeper whites. 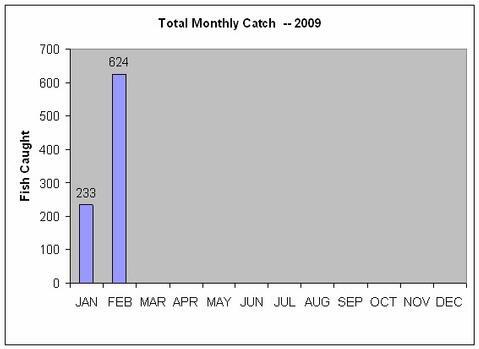 From 2:00p until around 4:30p there was a definite decline in the fish and bird activity. I caught nothing during this time. At 4:30, some birds began to get jittery and I again located fish, this time at Area 163. These fish showed as a mass on bottom in 23′. As I jigged for them, they aggressively struck a 3/4oz. slab used with a standard jigging technique. I boated 23 fish here, but, every single fish was undersized, some as short as 6 inches. I moved to nearby Area 382 and found a large school of white bass in the lower 1/2 of the water column over 34′ of water. I jigged and smoked for these fish and quickly caught 28 whites, all keepers with some going to 13″. At just minutes before sun set these fish quit. I returned to Area 138 to see if the birds that worked in the morning would work there in the evening, and they did. I finished the day off with 2 more legal hybrids and 4 chunky whites exceeding 13″ and going about 1.25 pounds — very nice white bass for Belton. All of these fish came on a horizontally worked blade bait. Fished a half-day morning trip today. This was classic late-winter fishing. The fish fed best early and with the start of a steady wind and were done by around 10:30 as skies got bright. This was the first day of moderate winds from the S. following the arrival of a cool, windy front 2 days ago which dropped overnight temps to 29 F the night after its passage, and down to 42 overnight. Air Temp: 42F at trip’s start. Temps peaked in the high 70’s in the afternoon . I began the day fairly shallow in 9-13 feet of water at Area 93 hoping the fish I found here last week would still be there despite the change of weather over the weekend. At this point, the winds were light and variable, with light puffs from the NE. As I began probing with a blade bait, I discovered there were fish here, but they were very sluggish. I caught 1 white bass pre-dawn, and had 3 others follow up to the boat. Following sunrise, there was a brief lull, then I managed 2 more fish vertical jigging a blade bait after they hit and missed the bait very near to the boat on a slow lift-drop style retrieve. The fish were actively striking at, but missing, the vertically jigged blade bait, so, I switched over to a 3/8 oz. TNT 180 slab . I continued probing around, finding fish with the blade bait, and then catching them with a jigging spoon. At one spot less than 4 feet in diameter, I put 5 whites in the boat in 5 consecutive drops, and finished it off with a small crappie from that same area. As the skies brightened, these fish got tougher until I decided to head to deeper water. I headed to Area 55 after seeing some birds patrolling this general area, and after seeing one tern act very hesitant to give up its location on the water’s surface. 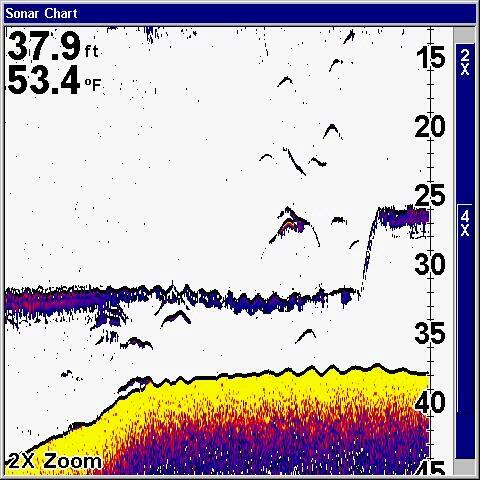 Sonar revealed suspended white bass hanging off the leeward side of a breakline going from 22′ to 33′. I went back to the 3/8 oz. TNT 180 and began to smoke for these suspended fish at a brisk pace on the retrieve. This fishing was very steady until the S. wind began to blow, and then it just took off. The fish came windward up onto the top edge of the breakline and were oriented on bottom in 21-24′ with many suspending as shallow as 11 feet deep. These suspended fish were particularly aggressive and chased and caught a quickly smoked slab. The bottom oriented fish tended to be, on average, about 1 inch larger, but were also less active, often striking only at a deadstick slab. Around 10a, the bite began to slow down, with the suspenders becoming less aggressive, and then not appearing on sonar at all. By 10:30 the bite here was over. In all, I managed 62 fish at this locale spread between Area 55 and Area 375. The catch included 59 white bass and largemouth – 2 short, and one going 3.75 pounds – the largest fish of the trip. Concerning the white bass, only 1 of the whites caught today was short, with a very strong showing in the 10.25 to 11.00 inch range. Only one white went 14 inches. After the deepwater bite shut down, I tried flatline trolling in the windblown straits of Area 374 with only one short largemouth to show for it. I also tried flatline trolling the “circuit” from Area 114 through Area 336 to Area 319 without result. I wrapped it up at 11:25. Air Temp: 43F at trip’s start. Temps peaked at only 53F in the afternoon due to a still N. breeze on the heels of a cold front’s passage. Wind: Winds were from the N at 8 at first light, building to around 18mph by trip’s end. Skies: Clear bright skies the entire trip. Got on the water pre-dawn today and noted large gulls patrolling the stretch from Area 96 to Area 117. I stayed as long as the gulls were looking hard, and they lead the way to fish. I fished at first with a blade bait to test the fish activity level and got a hard thump on my first cast letting me know the game was on. Due to the fact that I had a speaking appearance with the Austin Fly Fishers club in the evening, I went ahead and brought and used my flyrod even though it’s a little early in the season for fish to be consistently shallow. I found willing fish in 9-13 feet of water and so worked them over with the T-8 shooting head rig and a crease fly for a catch of 8 additional fish. The second fish I caught went 14.25 inches and 1.25 pounds, thus beating the former fly record of 1.09 pounds. Two other boat anglers were kind enough to help with the witnessing process on the spot, thus allowing the fish to be released in excellent condition. 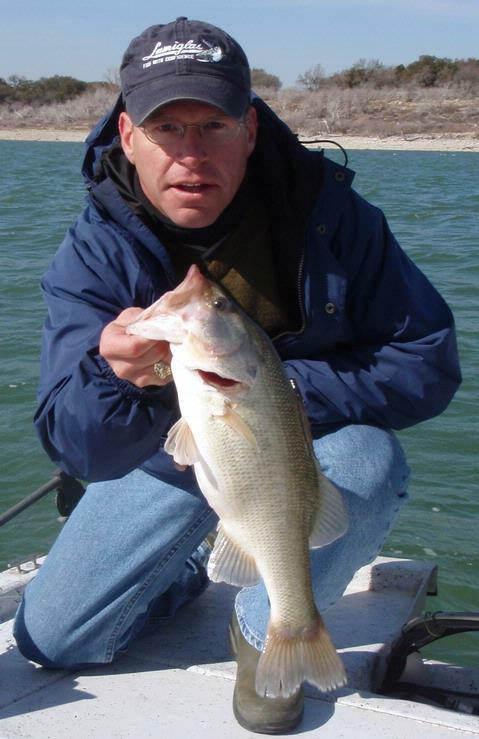 This fish has been submitted to TPWD as the new lake record – we should hear back within 10 days. By now, the gulls had moved over a bit deeper water (18′), so I put away the flyrod and took up the slab rod and worked the fish over staying under birds for about another hour, taking an additional 25 fish. By 9:30 or so the sun was up and bright and the shallow bite died out. I moved to check a few deepwater haunts and found fish very reluctant. In 4 stops I only caught 2 suspended fish on a slow smoking retrieve, both from Area 370. The wind had now built and was steady at 16+ mph, so, I headed to some windward shallower features and was able to flatline troll up a bunch of fish holding on a breakline from 10 to 16 feet at Area 374. I made many passes here taking 1 or 2 fish each pass before ending the day at around 12:50p with a tally of 54 fish landed including 52 white bass (all legal) and 2 largemouth (both short). I fished a half-day morning trip today on Stillhouse. This was our most productive trip of the winter thus far. The fish were the most aggressive I’ve seen them since late November and early December. The warming water and overcast conditions combined for some great white bass action. Air Temp: 47F at trip’s start. Temps peaked at only 53F in the afternoon due to heavy grey skies all day. Wind: Winds were from the ESE at 8-9 the entire trip. Skies: Heavy grey clouds with occasional sprinkles and light rain fell the entire trip. We got on the water pre-dawn today and gave flat-line trolling a try with little for show for it. As the skies brightened around (obscured) sunrise, about 8 gulls and 2-3 terns began feeding over “The Trough”. I moved up into them and found whites from top to bottom, and both in the trough and to the shallow sides of it. The whites on topwater appeared as individuals or in packs of 2-3 and were pursuing small shad to the surface, and only briefly appeared. I chose a blade bait in 3/8 oz. white color to span the water column, counting down the bait if I saw topwater, and otherwise fishing it lift-drop style when fish weren’t showing. The birds became more numerous and covered a large area as the action peaked. Everything was over by 8:10am, and by that time we’d managed 24 fish, all solid, healthy keeper whites, all going 11.5 to 12.5 inches. I again gave flatline trolling a try, and again scratched on that effort. I headed out to check for bird activity and found solid gull, tern, and loon presence at betwee Areas 89 and 143, at Area 140, at Area 373, and at the Area 370, 371, and 371 complex. By far the heaviest concentration of fish was at this last area, although these fish were a bit deeper and a tad less aggressive than the shallower fish were. The orientation of the fish was the same at each of these places — very aggressively feeding white bass found both on bottom and suspended within 12 feet of the bottom. The fish very aggressively struck at my slab, and were willing to chase quickly after it as I tried easing tactics and smoking tactics. 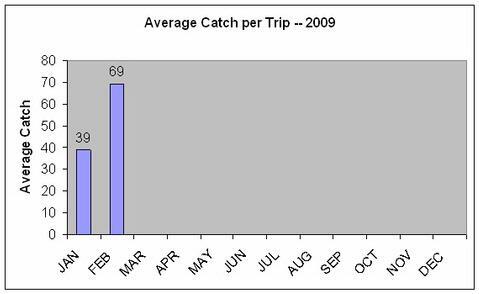 Off these areas we put an additional 91 fish in the boat including 2 largemouth bass, 1 drum, 1 channel cat, and 87 white bass, of which only 1 was short with the rest averaging right at 11.5 inches, and with 2 going exactly 14.5 inches. All fish came off the TNT 180 slab in 3/8 oz. for the shallower fish (23-31 feet) and in 3/4 oz. for the fish encountered at Areas 370, 371, and 371 (36-43 feet). With the fish as aggressive as they were, I found the larger slab helped avoid deep hooking and also got to depth quicker to maximize the catch while the bite was hot. I fished a half-day morning trip with Grandpa Dave D. of Austin, and his grandsons, Eric & Benn of Idaho. We caught fish, but we had to work for every single fish we caught. The conditions were tough — windless until 9a, then only a light breeze with clearing and brightening conditions to follow, and no bird activity. Air Temp: 57F at trip’s start. Temps peaked at 74F in the afternoon. Wind: Winds were very light from SSE if not still the entire trip. Skies: A thin overcast layer existed until just after sunup, then cleared and brightened afterwards. We moved over to Area 365 and fished it through to Area 211 catching a few fish on the downrigger, stopping to slab when good concentrations of fish showed, and scratched up a few more fish, 10 in all, including white bass, short hybrids, and 1 small black bass. We then headed over to Area 171 and found a tremendous amount of bait out at 34-40 feet but with no gamefish appearing mixed in at all. We continued to probe shallower and encountered white bass sprinkled along the bottom in 19-23 feet on a slight break here. We fished via downrigger and slabs and managed another 7 fish here (5 whites, 1 short hybrid, and 1 largemouth), again, all one at a time with no schools moving by and no multiple catches at any time. We made one final move after the S. wind picked up speed again over to Area 211 and found the fish a bit more perky. We only slabbed this time in 37-40 feet of water for fish that appeared tight to the bottom. For our efforts here we added 12 fish the the tally including 1 largemouth, 2 crappie, and 9 white bass. The last 3 whites came on the downriggers as the slab bite died off after a brief flurry. So, we ended the trip with a nice 12 fish run and the kids went home happy campers. Air Temp: Temps peaked at 74F in the afternoon. Wind: Winds were moderate from the SSW at ~15 at 2-9 the entire trip. Skies: Partly cloudy the entire trip. As I waited for the crew to arrive, I spotted fair bird activity over Area 364 at 12:40p. The next 20 minutes seemed like an eternity wondering if those birds would stay up and working until everyone got onboard, settled in, etc. so we could head over and wet our lines. As it turned out, the birds did stay active and, within minutes we had 3 hybrids in the boat, one for each boy! We continued to downrig for these fish which were suspended at 19-40 feet deep over the breakline here. We fished about 50 minutes here and tallied 9 fish total, including hybrids, whites, and 1 small black bass. Once the action died, we headed to Area 211 and looked things over with sonar. I found small clusters of white bass holding tight to the bottom here, thus calling for a slabbing approach. At this point the bird activity was nil and the wind was slackening, so I knew the bite would be light and tough, and it was. Regardless, the boys listened well and got the hang of appropriately adjusting the depth of their slabs, and, before long they were catching mostly smallish white bass on their own. We racked up 28 more fish here. Once we wore a hole in the bottom at Area 211 and the fish slacked off, we resumed downrigging, this time over Area 365. There is a fairly steep breakline here and the fish were stacked from bottom up to 3 feet off of bottom and were beginning to perk up as the afternoon was wearing on. We hit fish after fish here on White Willow spoons, all right at the top of the breakline, and added 12 more fish to the tally before giving slabbing another try given how consolidated the fish were here. No sooner did we break out the slabs, than we spotted a flurry of bird activity at Area 368. This area had a touch of timber and a slope from 21 to 34 feet. As we arrived, I saw suspended fish on sonar, and gave the boys a quick lesson in “smoking” for suspended fish. They caught on to the technique really quickly and managed to put a final 21 additional fish in the boat via a combination of smoking and slabbing, including the big fish of the day, a 5.5 pound hybrid caught by the birthday boy, Trevor. At 70 fish, the boys were playing out and Ken gave me the nod to head back to the dock. After bidding the group farewell, I headed out to scout for shad and, on the way, encountered yet another helpful bunch of birds, this time between Areas 366 and 367. I motored near and then cut the motor and just observed for a while. I noted large, hybrid-sized boils on the nearly calm water and so tied on the largest shad imitator I had (a Storm Wild Eye about 5 inches long) in order to select for hybrid and avoid the white bass that appeared to be mixed in. For 50 minutes I fished this action for a total of 9 keeper hybrid and 2 whites (I still don’t know how those whites got that big, single hooked lure in their small mouth!). That ended the day with exactly 81 fish. Windy! Windy! Windy! I fished Stillhouse today and as I sit and write this, my body still feels like it’s on the waves. As happened on Belton on Thursday, the fish didn’t really get into gear until mid-day. Air Temp: 63F at trip’s start, warming to low 70’s in the afternoon. Wind: Winds were moderate from the SSW at ~15 at dawn, but steadily built to a peak speed of 25 mph with stronger gust by noon. Skies: Cloudy grey skies all day. I launched and gave flatline trolling a try due to the 2 nights of warm weather and wind we’ve had, but little was going on up shallow. I managed 2 white bass on a few passes from Area 999 to Area 127 and saw little on sonar as I trolled. I spent the next hour searching with sonar and seeing precious little in the way of bait or gamefish. Everything I did find was main channel related. At Area 362 I found scattered white bass at mid-depth over 41-43 feet of water. These fish were very reluctant to chase or strike but I managed to put 14 in the boat in about 90 minutes. 12 of these were keeper whites, 2 were short largemouth bass. Every fish I caught appeared as a single mark on sonar. When the fish appeared, I reeled the slab (3/8 oz. white TNT 180) up from beneath the fish and, once I was even with the fish, either stopped it dead or slowed it to a crawl, and then slowly eased it upwards looking for a response on sonar. If the fish responded, I continued the lure upward fairly slowly until the fish overtook it and I could get a hookset. By 11:30 this had played out. My final stop today came at Area 363 (see sonar reading above). This was right off the river channel, and the fish were holding where the flat rolled over into the channel at 38-43 feet. The scenario was much the same as at Area 362 – the fish were more active and more abundant, but that same tedious, one-fish-at-a-time methodology was required. Every once in a while a small school of whites would ramble across the bottom allowing for some straightforward slabbing right off bottom, but, more often than not, the fishing was for individual, sluggish, suspended fish. I stayed on these fish nearly 2 hours, with the peak activity coming around 12:30 to 12:55. Otherwise, it was slow but at least consistent. I boated a total of 37 fish here, including 2 short blacks, 2 keeper blacks, and 33 keeper whites, with the largest of the whites going 12 inches. By 2:00p the wind was gusting over 30mph and I couldn’t hold in place to jig accurately any longer. I let down one downrigger knowing the fish were not active enough to pursue a moving bait, and, to no surprise, didn’t come up with anything on the downrigger. I headed in. I fished Belton today as a little scouting venture in advance of a trip this coming week with 3 young men from Troy, TX. Although the morning started off slow, things got going in the late morning. I was actually able to take several fish on a horizontally presented blade bait which is something the fish haven’t responded to since early December. Wind: Winds were moderate from the SSE at about 9 pre-sunrise, and built slowly up to 15-16 mph by departure time. Skies: Partly cloudy until around 10am, then turning fair for the remainder of the day. Environmental note: The first flocks of Sandhill Cranes headed back north were sighted on 02 Feb., just a tad earlier than usual. I launched and found pre-sunrise birds working in strong numbers (both gulls and terns) from Area 296 down to Area 358. As I closely watched these birds, I could see they were sipping shad off the surface, but these shad were not driven to the top by gamefish. I headed down to Area 99 and was pleasantly surprised to find small pods of gamefish both suspended at mid-depth and also suspended just off bottom over 24 to 35 feet over this entire area. I stopped to jig and struck out and also struck out after trying a downrigging approach with a White Willow and a Swimmin’ Image at staggered depths. Looking back, I should have gone with a smaller Pet Spoon, as I discovered later in the day the fish were keyed in on smaller forage. After scratching my head on Area 99, I slipped over to the breakline at Area 356 and picked up one average white bass directly off bottom after seeing a small congregation of fish right on the slope. Nothing else was going on here, so I moved on. I headed to the Area 294 complex and looked all over it, finding fish (albeit few of them) on the windward SSE edge of the feature in ~41 feet. I jigged for several minutes with only a short largemouth to show for the effort. I moved on. I headed to Area 354. This area was somewhat sheltered. I saw several loons and a sprinkling of gulls and terns, as well as a bit of bait, structure and some gamefish in 41-43 feet here and so I stopped to jig, but found nothing. I moved on to Area 355. I fished at the top of the breakline here at 37 feet and immediately got a suspended hybrid of about 4 pounds on a smoked TNT180 3/8 oz. slab. As I continued jigging, I also picked up 2 decent white bass, 1 short largemouth, and 1 small crappie here. These fish were at the top of the breakline in 37 feet and down to 41 feet. Although there were fish here, there was no indication of great numbers of fish. I paused and took a look around with the glass and found a strong flock of terns working in the distance. I headed to Area 359 and found terns working over a 250 yard area. As I eased in on this activity, I found bait very scattered from top to bottom and regularly occurring wolfpacks of 2-8 fish hanging together and working over the bait. Long story short, I stayed on top of these fish during and well after the bird activity, and put 24 fish in the boat before things slowed to a crawl including 2 legal hybrid, 1 short hybrid, and 21 whites going right at 11.5 inches. Every single fish caught was suspended, in fact, I saw no fish signals appearing on bottom on sonar. These fish responded to the white 3/8 oz. TNT180, but responded even better to a chrome 1/8 oz. Rattle Snakie. Regardless, the fish were extremely finicky. I had to bring the slab from beneath the fish, stop it on the fishes’ nose, and then slowly begin raising it up to provoke a chase response. 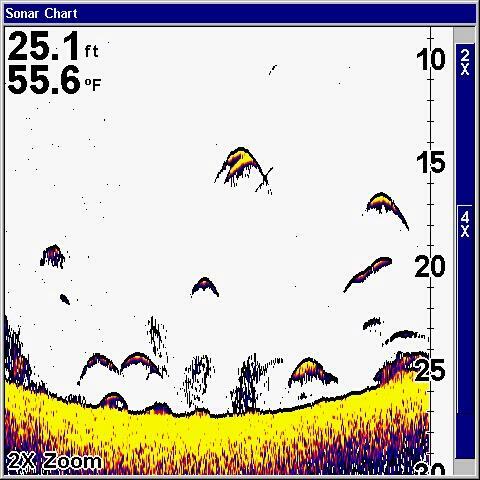 Occasionally, when a larger school of fish (4-8 in number) appeared on sonar. I could raise or lower the slab into the center of mass and the fish would hit it deadsticked. There was a brief period of enhanced activity from 11:30 to 11:45 when the fish began chasing a bit more quickly, but that ended quickly. Around 12:20p, a renewed flurry of tern and gull activity appeared at between Areas 357 and 358. Long story short, I found fish both suspended and on bottom at between 24 and 41 feet. The best action came at about 26 feet down over 41 feet of water. Seeing how aggressively and frequently the terns were hitting the water prompted me to throw a horizontal blade bait. When I did, I found hybrid up high and whites down deeper. I landed 10 fish in short order including 3 legal hybrid and 7 twelve inch white bass. On several casts I had hooked fish come unbuttoned, only to have another fish pursue and be hooked indicating both a quantity of fish and that they were in an aggressive mood. As often happens with action that begins in bright conditions, this action didn’t last long. By 12:50p this action was over. I called it a day at that time after seeing the birds finally come to rest on the surface. One note about equipment: I fish a variety of lightweight, fast moving baits presented horizontally (like cranks, traps, blade baits, and the like) and have searched a long time to find one rod to cover all of these applications. I’m now hooked on the Lamiglas IRFA703. This 7′ rod loads up and throws light baits long. The soft, fast tip gives toward the fish as they open their mouths to vacuum the bait back, thus preventing the misses caused by stiffer rods. The rod then has enough backbone in the lower section to close the deal but with enough flex in the top end to keep a skin-hooked treble from tearing out. I’m not big on looks, but this rod is pretty sharp. I fished a brief, solo scouting trip this evening mainly looking for birds and bait, and to see what impact the cold front that came in overnight had on the fish. Air Temp: 43F at sunrise heating up to 60F by afternoon, then falling off rapidly after sunset to 52 by trip’s end. Wind: Winds were very light from the NNE at 2-3 mph. Skies: Clear and bright high pressure conditions. Not expecting to find much due to the nearly slack winds, I quickly checked 5 areas today with sonar and found fish at only 1 of them. Birds were not a factor today. I only saw one group of terns working over loons, and all other birds resting. My one and only stop came at Area 352 at around 5pm at the channel drop from 28 to 37+ feet of water. Sonar showed suspended bait and gamefish in abundance here. With only an hour before the sun would set, I got right to work with a 3/8 oz. TNT 180 slab in white. There was a mix of white bass, crappie and largemouth bass here, with all of them behaving identically. All fish were suspended, tightly bunched in small packs of 2-5 fish, and all barely moving at all. A deadstick presentation was the only presentation these fish would hit. All of the fish hit as crappie usually do — that is, they slowly approached the bait from beneath, and then inhaled it while moving upwards, thus easing the tension felt in the rod tip. An immediate hookset was necessary to catch these light biters. This scenario played out over and over for a total of 21 fish taken here in ~80 minutes’ time. The sun disappeared below the horizon at exactly 5:59p, and the last fish (a small crappie) hit at 6:20p. The breakdown on the fish caught included 11 white bass, 8 crappie, and 2 largemouth bass. At sunset I switched over from the slab to the green shad colored Jigger Shad after the fish lost interest in the slab — but caught only 2 fish on that presentation.